Ever wondered why the people living around nature are healthier and happier than city people? Losing yourself in nature while enjoying the air, the scents, the vegetation and the sounds of birds and animals that live there. But did you know that there are some amazing health benefits as well? Apart from the obvious ones like getting fresh air, there are studies that show that a walk in nature with lots of trees may be the healthiest thing you can do. Nature always has a great impact on us because we are a part of nature and nature is our 2nd home. Now, you don’t have to live in the woods to experience nature as Pacific Golf Estate is bringing you the most luxurious homes in nature and mountains. The new residential project in Dehradun is the new living destination for people who want to lose themselves in nature. This is the best project in Dehradun which is covered with the beautiful green environment in the lap of the Himalayan range. The project is highly connected with various modes of transportation and other modern features like beautiful landscapes, sports complex with all sports facilities like Squash, Club House Tennis, Badminton, Swimming Pool, Basketball, and much more. Also, this project is offering the best 1 bedroom flats in Dehradun in front of mountains for a mesmerizing and soothing view. 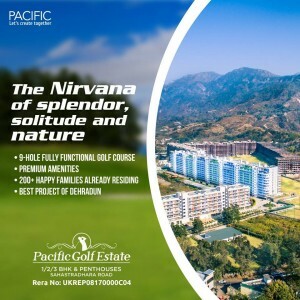 So, don’t think and book your dream home in Pacific Golf Estate and experience the aliveness around nature and mountains along with luxury living.